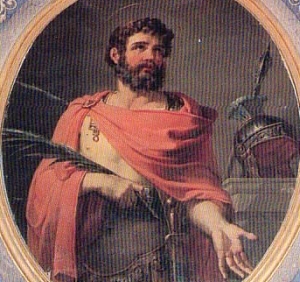 In the year 363, Emperor Julian the Apostate made Apronianus the Prefect of Rome, replacing Flavian. Flavian, was discovered to be a Christian, so he was removed from his office, branded on the forehead as a slave and exiled to the village of Acquapendente in Tuscany of Italy. There Flavian was tortured and died of his wounds while in prayer. Flavian was married to a woman named Dafrosa, and he had two daughters named Bibiana and Demetria. Dafrosa was sent to the house of a certain Faustus, who desired to have her in marriage, but she refused to marry him, and instead converted him to faith in Christ. After his baptism he was executed and his body was thrown to the dogs to be devoured; but Dafrosa saved his body and secretly buried it at night. Then, in a dream, her husband Flavian appeared to her, and called her to join him in heaven. After five days, whilst engaged in prayer, she departed for the heavenly mansions. However, another account says Saint Dafrosa, a few days after the exile of her husband, was taken outside the city of Rome and beheaded. Meanwhile, Bibiana and Demetria were stripped of their possessions and left to suffer in poverty. However, they remained in their house, spending their time in fasting and prayer. Apronianus, seeing that hunger and want had no effect upon them, summoned them. Demetria, after confessing her faith, fell dead at the feet of the tyrant. Bibiana was reserved for greater sufferings. She was placed in the hands of a wicked woman called Rufina, who in vain endeavored to seduce her to reject Christ. She used blows as well as persuasion, but the Christian virgin remained faithful. 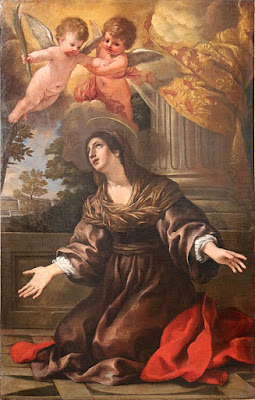 Enraged at the constancy of this saintly virgin, Apronianus ordered her to be tied to a pillar and beaten with scourges, laden with lead plummets, until she died. The Saint endured the torments with joy, and died under the blows inflicted by the hands of the executioner. Her body was then put in the open air to be torn apart by wild animals, yet none would touch it. After two days she was buried. 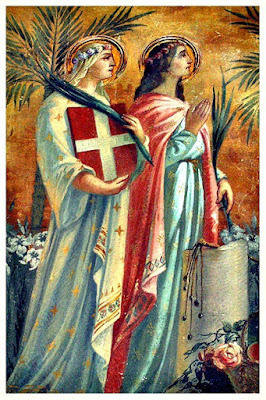 Pope Simplicius in 465 built a church in her honor over the place of her martyrdom, where her body rested and was venerated by the faithful. The Basilica of Santa Bibiana still exists. Saint Flavian is celebrated on December 22, Saint Daforsa is celebrated on January 4, Saint Demetria is celebrated on June 21, and Saint Bibiana is celebrated on December 2.